It's just this one special ingredient that makes the difference. Dear readers, if you haven't met this culinary wonder, let me introduce you now to my new friend 새우젓. What was that, you ask? My friend's name is saewoojeot, pronounced "say-oo-jawt," and in English is best described as "salted shrimps." Honestly, it is no understatement to say that saewoojeot has revolutionized my kimchi making. Oh wow. 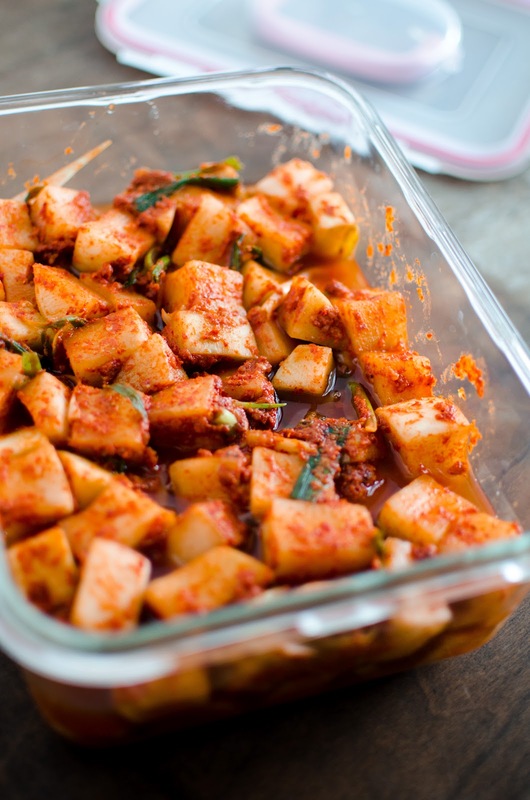 I love kimchi in all its many forms, but one of my favorites for the past few years has been the cubed radish kimchi 깍두기 (kkakdugi). 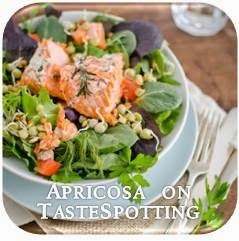 It's deeply-flavored, crunchy and refreshing, and it's a wonderful aid to digestion. A while ago I shared one recipe that I'd been working off of, but to be honest, it didn't quite hit the mark for me. 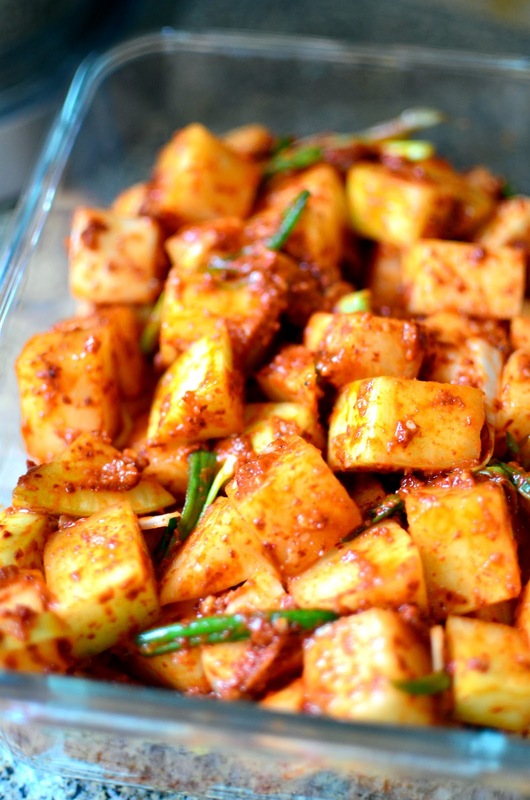 I've been trying various kkakdugi recipes here and there in the meantime, pursuing this holy grail, and now I think I have finally found the recipe for me. I've always been in suspense after mixing up a fresh batch of this radish kimchi, waiting impatiently for it to ferment and for the flavors to develop. Wondering if it will taste the way I know it ought to taste. Then being left slightly disappointed each time I tasted my successive kkakdugi attempts. So when it came to this one, let me tell you I was utterly transported with joy I was when I realized this was it! Unlike several other recipes I've tried, this one requires saewoojeot. 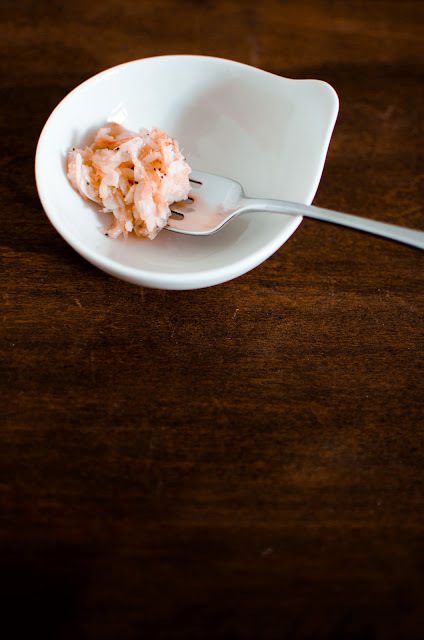 These salted shrimps are suuuuper salty and briny, but they give a depth of flavor that was never had before. And I think it is what makes all the difference. So where did this wonderful recipe come from? From Hyosun Ro, blogger behind "Eating and Living." Using the finest Korean radish for this kkakdugi (my experimentation shows why you shouldn't use regular daikon), I made it pretty much exactly as she directs, although I did omit the raw fresh shrimp. 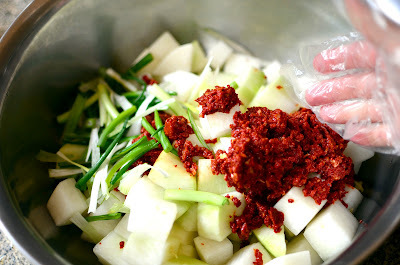 For ease of mixing and mincing the ingredients of the kimchi paste, I used an immersion stick blender (though a small food processor would be another great option). 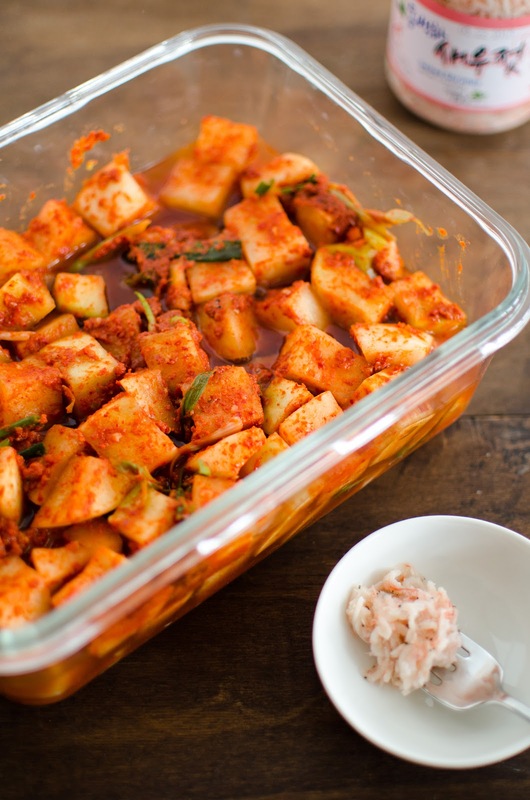 Make sure you take the time to massage the paste onto each cube of radish--with disposable gloves, this process is a breeze and will ensure the best kimchi. 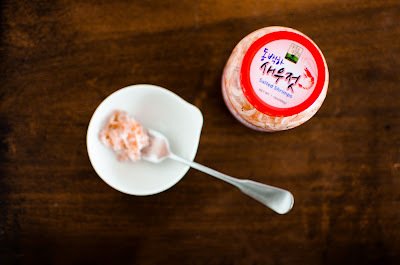 So grab yourself a jar of saewoojeot next time you're at a Korean market and then head on over to check out Hyosun's recipe. You won't be disappointed! Wait...there's a little extra for today! The Korean language is written using Hangeul, a phonetic alphabet system of consonants and vowels. Each syllable is written to fill the space of a square and includes a starting consonant (or place holder for syllables starting with a vowel sound), a vowel, and sometimes a final consonant. It is easy to learn how to write mu, because we're just working with a single syllable! ㅁ = "m" and ㅜ = the "oo" sound (transliterated properly as "u"). So stack them into the space of a single square, working top to bottom, and you get 무! Pretty cool, hunh? Bonus question of the day: Where else on this post can you spot the ㅜ ("oo") vowel? A very special friend, indeed. No not the 새우젓, but you! Love all your posts and esp. highlighting the Korean ingredients like this one. :) Have a wonderful week, Erica. Thanks Kay! It's always so nice to be able to get my hands on good ingredients for more authentic flavor. :) I hope you have a great week too! I guess that's why they have so many different kinds of it available in the markets! Oh wow! Thank you so much for the shout out and the link, my friend!! A nice job introducing saewoojeot, and your kkakdugi looks great. I am incredibly proud of you, erica. Cheers! So, I was at the local H-mart and guess what I bought? Kkakdugi..Not homemade, but really the ajjumas there make tasty kimchi. Anyway, I was eating them last night my youngest who's not yet 2 was asking for it and I gave her a small piece ce b/c she was SO insistent and I totally thought she would spit it back out b/c it's spicy... she ATE it and asked for more!!! 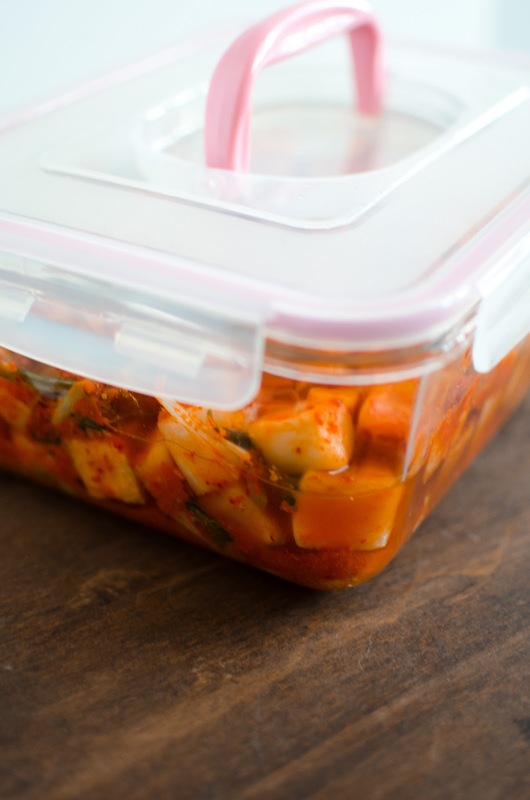 My oldest didn't start eating kimchi until she was 3 years old, and it was rinsed in water first! Soyon--oh my goodness, I am SO excited to hear this news! How awesome that Peanut loves kkakdugi--I am thrilled! yayayay! It's a joy to see you experimenting so much till you hit the mark. I would rather wait for people to experiment and pinch their best recipes...you're a target for me Erica! beautiful minimalist photo and sincere intro to your "fren"!